A Hollywood legend like no other, Academy Award(R) Winner John Wayne remains a true American icon. On horseback in the wild west or in battle on the front lines, the "Duke" stands tall as the silver screen's greatest hero. Here for the first time are ten of his most outstanding films, including: the 1960 Oscar(R) Best Picture Nominee "The Alamo" and "The Barbarian and the Geisha", available on DVD for the very first time. 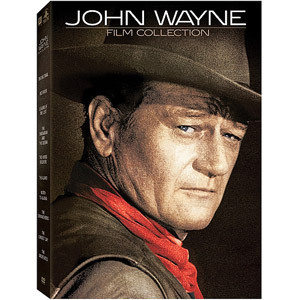 Also includes "The Big Trail", "Red River", "Legend of the Lost", "The Horse Soldiers", "North to Alaska", "The Comancheros", "The Longest Day", and "The Undefeated". "The Big Trail" and "Red River" are Presented in Full Frame Format, All Other Films are Presented in Widescreen Format. Perfectly timed for Father’s Day, this collection is available for the SRP of $49.98 U.S. / $69.98 Canada.